How are you all?................ All ready for Halloween?............... Aye Aye Captain reached 78 'I's' before I lost count and that was just after lunch so I reckon I wasn't that far out at all. As it is close to Halloween, I thought I'd tell you a little about our resident spirit, Sid. This house is 150 years old and these old 4 walls will have seen some births and deaths over those years. When we moved here 8 years ago it was to escape and get away from my first husband (who still doesn't know where we are), we moved 25 miles away from where I'd grown up and from where I work hence our commute up and down the motorway every day. When we brought the house, it belonged to a 'new age couple' who had painted the rooms in some very modern loud garish colours. 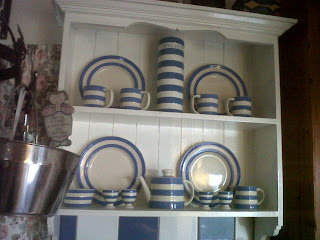 So 2 days after we moved in we spent £300.00 on paint and set to with the paint brushes and rollers. Three weeks later it looked like a 'proper' home. But each time we finished a room we'd have a spell of the lights flickering on and off, in that particular room. My hubby checked the electrics, but could never find any reason why for it. As this house is very similar to my Nan and Grand Dad's house from when I was little and the fact that we moved here 2 years to the day after my Grand Dad passed away and that the street we moved to has his christian name as our street name - I used to say 'Oh it's my Grand Dad just saying it looks better!' jokingly. But 2 months after moving in I went to see a spiritualist who said to me "You know you have a spirit in that house" - "It's someone who lived there a long time ago and someone who loved that house - he planted something red in the garden" and I said " I've joked that it was my Grand Dad" and she said "No it's someone who loved his home and he's so pleased that you've put it right now and it's looking like it should". There would have been a black leaded fire grate in the kitchen, which someone removed (what a shame) we have a log burner there now and in the corner there I have a comfy chair, everyone who comes into the house always seem to make a beeline for this chair - I love sitting there, there's such a feeling of peace and contentment in that corner and I wonder if this is where 'Sid' (that's what we decided to call him) used to sit. The lights stopped flickering a long time ago, now Sid's party trick is to turn the TV on for about a minute and then off again. My brother came to our house a couple of years ago and we were all (the family) sitting in that room and we were telling him about the T.V. going on and then going off - he said "No I don't believe it" a couple of moments later, the T.V. went on and then off............... there was a sharp intake of breath all around the room and I said to him "Now do you believe it?" But despite this I never feel scared - I'm sure that Sid knows that we love this house as much as he did and we all live in harmony. I was on my own and cooking some Apple Chutney a few weeks ago and wasn't sure whether it was done and must have spoken out loud as to whether it needed any longer......the T.V. went on then it went off, so I just said I'll take it that it's cooked then Sid and turned the jam pot off!! Wow! A very interesting story. I am open minded about spirits/ghosts but I do think houses/dwellings have that happy or not-so-happy feeling about them. It is like they absorb from whatever/however life was lived there before. I remember viewing a place years ago and it just felt wrong. Unhappy and cold. I didn't buy it but found out a bit later that someone had been very ill there and I think died there too. Yikes! I agree, "It is like they absorb from whatever/however life was lived there before". I know ours was a hppy family home for 55 years as the daughters sent me a little card after we moved in, but the neighbours told me The Dad was a "difficult" (read grumpy)old chap. Not long after we moved in and started renovating, the tiny pantry window cracked right across, completely out of the blue. 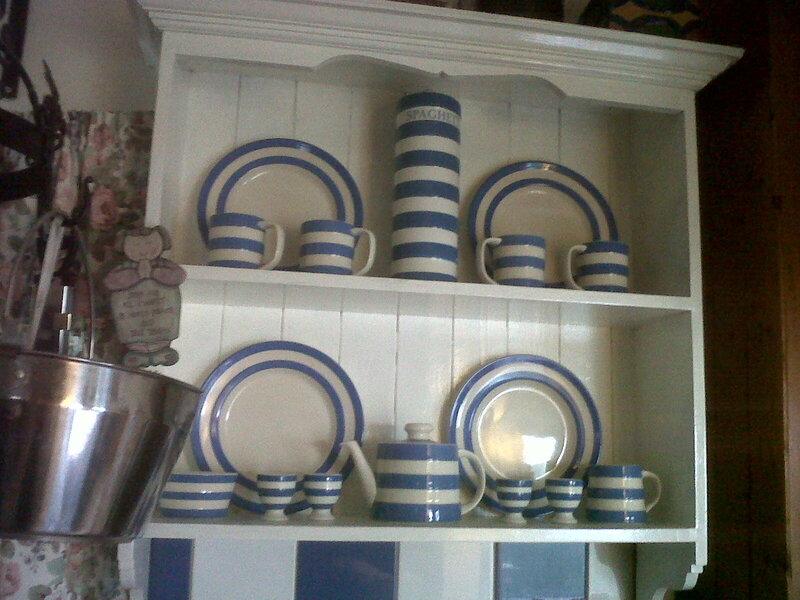 Love the photo of your dresser top and blue and white china.